Home > Printable Coupons > New Excedrin Coupon | Makes It $4.99 at Walgreens! 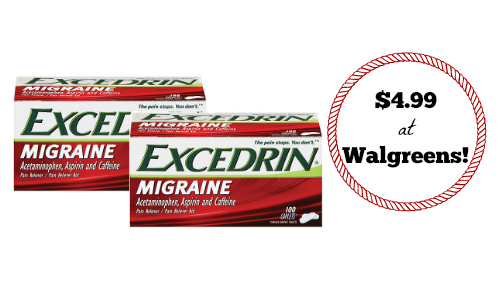 New Excedrin Coupon | Makes It $4.99 at Walgreens! Be sure to print a new Excedrin Coupon to get a great deal next week at Walgreens! You can stock-up for over half off. Print the coupon now so you’ll have it when the sale starts. Like getting it for $9.98 or $4.99 each! That is a great price at over half off! The deal will be available 5/25-5/31. See all of the Walgreens deals.